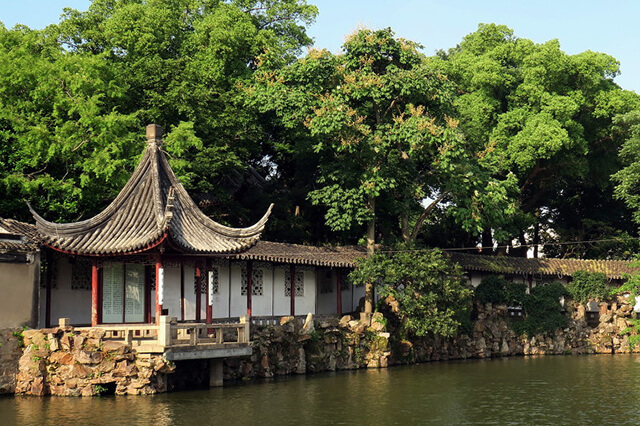 Pavilion of Surging Waves, located in Sanyuanfang, south of Suzhou city, Jiangsu Province, is the oldest garden in Suzhou. 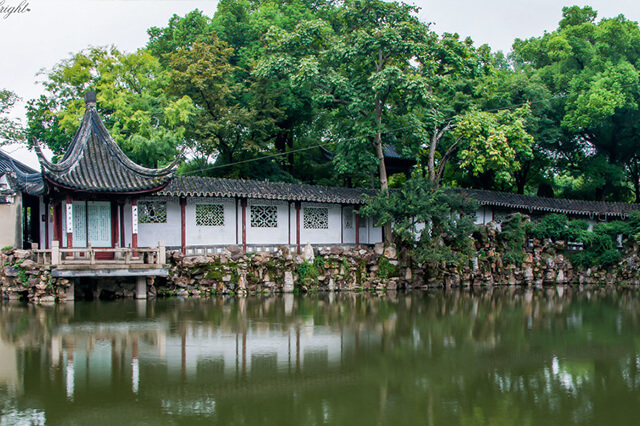 Canglang Ting, located in Sanyuanfang, south of Suzhou city, Jiangsu Province, is the oldest garden in Suzhou. It covers an area of 10,800 square meters and has a history of more than one thousand years. Through the transformation of several famous people in ancient times, today it still remains the typical style of classical gardens. Walking into the scenery spot, you can see a pool of green water around the outside of the garden, which reflects the scenes clearly. Besides, plenty of stones are placed surrounding the lake. The jagged shapes of the stones add so much charm to the lake. The wooded hills are the center of the spot. Around the wooded hills, many classical buildings with the style of south regions of the Yangtze River surround it. The long corridors of the garden rise and fell along the hills, infiltrating through the leaking windows on the corridors, connecting the hills and water in and out the garden, and integrating the water, lakes, rockeries, and pavilions. The whole scenery constitutes a beautiful ink painting scroll. Besides, there are various of plants in the garden, which contains old trees and all kinds of flowers and grass. Among them, the most typical plant in Canglang Ting is bamboo.Because of the bamboo, the garden also becomes greenery and quiet. When you walk slowly in the garden, you will feel the pleasure as if you were standing outside the world.